The First Attacks in Egypt by Heathens. "Sibylline Books" and "The Wisdom of Solomon." Attacks by Christians and Mohammedans. Men of pious zeal who defended both the Jewish religion and the Jewish race against the attacks and accusations of their enemies by writing, either in the form of dissertations or of dialogues, works in defense of the spirit and doctrines of Judaism, so that its essentials might be placed in the proper light. It was in the nature of things, therefore, that they were impelled to expose the general weakness of the positions of their antagonists, and to attack those positions rigorously; hence the apologies are, at the same time, polemical arraignments. So long as the Jewish state was independent and respected by neighboring peoples, and so long as religious reverence retained its hold upon the heathen nations with whom the Jews came into contact, it was unnecessary to ward off attacks on their nationality, on their religious teachings, or on their manners and customs. They dwelt in harmony with Persians when Cyrus established the Persian empire, and later with Greeks; they dwelt alongside of Parthians and New Persians, and their Judaism received no manner of offense. But when the Jewish state fell into internal decay, and the Greeks, with whom the Jews held the closest relations, lost their reverence for their own deities; when, furthermore, with the translation of the Bible into Greek, the Hellenes were introduced to a literature that claimed at least equality with their own; and, finally, when the Egyptians were by that translation informed of the pitiful rôle their ancestors had played at the birth of the Jewish nation, these peoples felt themselves severely wounded in their national vanity. It was, accordingly, in Alexandria that antiJewish literature originated, to withstand which the Jewish Apologists resident there devoted their energies. Manetho, an Egyptian temple scribe at Thebes, was the first to assail the Jewish nationality with all manner of fables invented by himself. Opportunity to disseminate misinformation concerning the Jews had been afforded by the Syrian king Antiochus Epiphanes, whose wonderful stories concerning his experiences in the Temple of Jerusalem were seized upon and elaborated by the anti-Jewish writers of Alexandria. In this city, the capital of Egypt, dwelt numerous Jews who were distinguished for their intellectual activity and moral life, and many Greeks detested the Jews for their difference in moral ideals, founded as they were upon religious codes quite different from their own. Alexandria was accordingly the market where unscrupulous writers were certain of finding sale for their multifarious calumnies against the Jewish people. In Alexandria, consequently, the earliest Jewish Apologists made their appearance. The first generation of Jewish Apologists flourished from the beginning of the first century B.C. to the middle of the second century of the common era. In this period are included those Apologists who encountered the attacks of the ancient heathens. The early Greek fashion of writing under a pseudonym had been transplanted to Alexandria; works were issued purporting to be productions of the great men of antiquity. 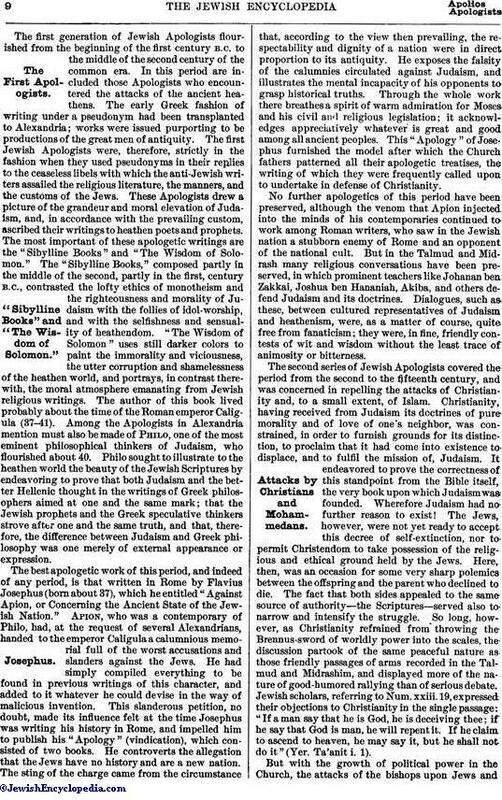 The first Jewish Apologists were, therefore, strictly in the fashion when they used pseudonyms in their replies to the ceaseless libels with which the anti-Jewish writers assailed the religious literature, the manners, and the customs of the Jews. These Apologists drew a picture of the grandeur and moral elevation of Judaism, and, in accordance with the prevailing custom, ascribed their writings to heathen poets and prophets. The most important of these apologetic writings are the "Sibylline Books" and "The Wisdom of Solomon." The "Sibylline Books," composed partly in the middle of the second, partly in the first, century B.C., contrasted the lofty ethics of monotheism and the righteousness and morality of Judaism with the follies of idol-worship, and with the selfishness and sensuality of heathendom. "The Wisdom of Solomon" uses still darker colors to paint the immorality and viciousness, the utter corruption and shamelessness of the heathen world, and portrays, in contrast therewith, the moral atmosphere emanating from Jewish religious writings. The author of this book lived probably about the time of the Roman emperor Caligula (37-41). Among the Apologists in Alexandria mention must also be made of Philo, one of the most eminent philosophical thinkers of Judaism, who flourished about 40. 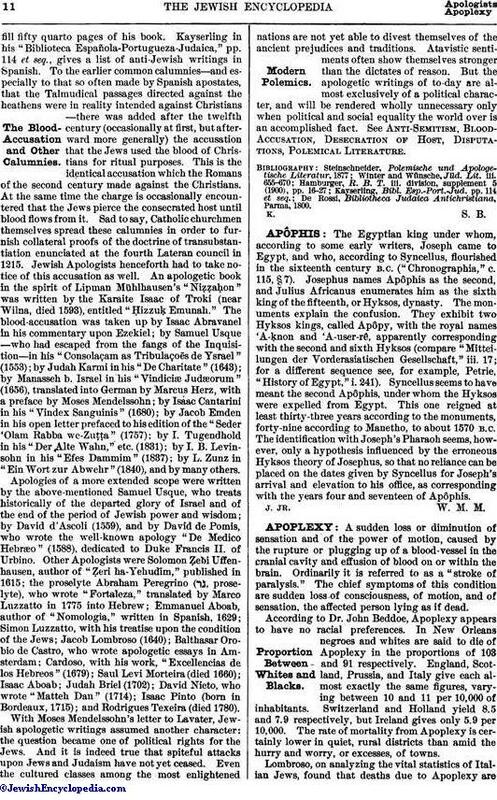 Philo sought to illustrate to the heathen world the beauty of the Jewish Scriptures by endeavoring to prove that both Judaism and the better Hellenic thought in the writings of Greek philosophers aimed at one and the same mark; that the Jewish prophets and the Greek speculative thinkers strove after one and the same truth, and that, therefore, the difference between Judaism and Greek philosophy was one merely of external appearance or expression. The best apologetic work of this period, and indeed of any period, is that written in Rome by Flavius Josephus (born about 37), which he entitled "Against Apion, or Concerning the Ancient State of the Jewish Nation." Apion, who was a contemporary of Philo, had, at the request of several Alexandrians, handed to the emperor Caligula a calumnious memorial full of the worst accusations and slanders against the Jews. He had simply compiled everything to be found in previous writings of this character, and added to it whatever he could devise in the way of malicious invention. This slanderous petition, no doubt, made its influence felt at the time Josephus was writing his history in Rome, and impelled him to publish his "Apology" (vindication), which consisted of two books. He controverts the allegation that the Jews have no history and are a new nation. The sting of the charge came from the circumstance that, according to the view then prevailing, the respectability and dignity of a nation were in direct proportion to its antiquity. He exposes the falsity of the calumnies circulated against Judaism, and illustrates the mental incapacity of his opponents to grasp historical truths. Through the whole work there breathes a spirit of warm admiration for Moses and his civil and religious legislation; it acknowledges appreciatively whatever is great and good among all ancient peoples. 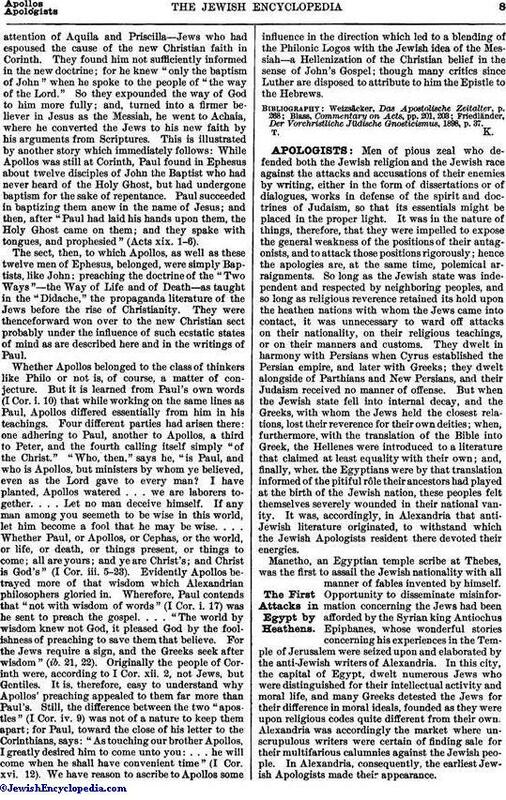 This "Apology" of Josephus furnished the model after which the Church fathers patterned all their apologetic treatises, the writing of which they were frequently called upon to undertake in defense of Christianity. No further apologetics of this period have been preserved, although the venom that Apion injected into the minds of his contemporaries continued to work among Roman writers, who saw in the Jewish nation a stubborn enemy of Rome and an opponent of the national cult. But in the Talmud and Midrash many religious conversations have been preserved, in which prominent teachers like Johanan ben Zakkai, Joshua ben Hananiah, Akiba, and others defend Judaism and its doctrines. Dialogues, such as these, between cultured representatives of Judaism and heathenism, were, as a matter of course, quite free from fanaticism; they were, in fine, friendly contests of wit and wisdom without the least trace of animosity or bitterness. The second series of Jewish Apologists covered the period from the second to the fifteenth century, and was concerned in repelling the attacks of Christianity and, to a small extent, of Islam. Christianity, having received from Judaism its doctrines of pure morality and of love of one's neighbor, was constrained, in order to furnish grounds for its distinction, to proclaim that it had come into existence to displace, and to fulfil the mission of, Judaism. It endeavored to prove the correctness of this standpoint from the Bible itself, the very book upon which Judaism was founded. Wherefore Judaism had no further reason to exist! The Jews, however, were not yet ready to accept this decree of self-extinction, nor to permit Christendom to take possession of the religious and ethical ground held by the Jews. Here, then, was an occasion for some very sharp polemics between the offspring and the parent who declined to die. The fact that both sides appealed to the same source of authority—the Scriptures—served also to narrow and intensify the struggle. So long, however, as Christianity refrained from throwing the Brennus-sword of worldly power into the scales, the discussion partook of the same peaceful nature as those friendly passages of arms recorded in the Talmud and Midrashim, and displayed more of the nature of good-humored rallying than of serious debate. Jewish scholars, referring to Num. xxiii. 19, expressed their objections to Christianity in the single passage: "If a man say that he is God, he is deceiving thee; if he say that God is man, he will repent it. If he claim to ascend to heaven, he may say it, but he shall not do it" (Yer. Ta'anit. i. 1). But with the growth of political power in the Church, the attacks of the bishops upon Jews andJudaism took on a harsher animus. 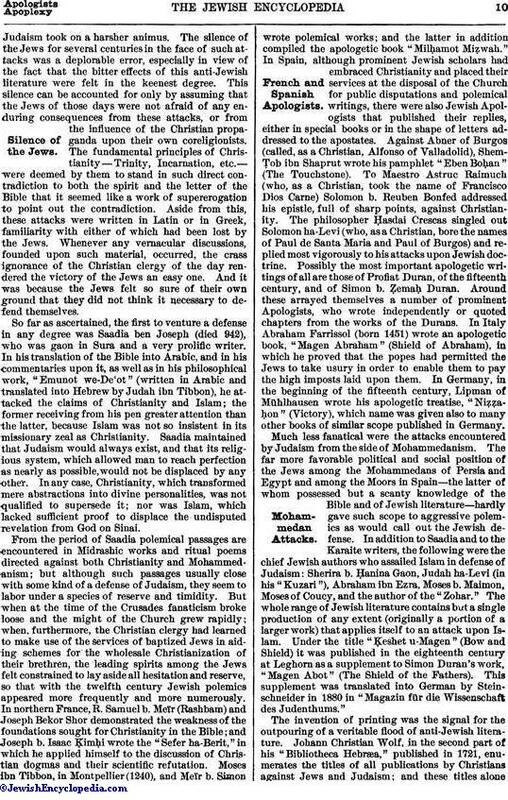 The silence of the Jews for several centuries in the face of such attacks was a deplorable error, especially in view of the fact that the bitter effects of this anti-Jewish literature were felt in the keenest degree. This silence can be accounted for only by assuming that the Jews of those days were not afraid of any enduring consequences from these attacks, or from the influence of the Christian propaganda upon their own coreligionists. The fundamental principles of Christianity—Trinity, Incarnation, etc.-were deemed by them to stand in such direct contradiction to both the spirit and the letter of the Bible that it seemed like a work of supererogation to point out the contradiction. Aside from this, these attacks were written in Latin or in Greek, familiarity with either of which had been lost by the Jews. Whenever any vernacular discussions, founded upon such material, occurred, the crass ignorance of the Christian clergy of the day rendered the victory of the Jews an easy one. And it was because the Jews felt so sure of their own ground that they did not think it necessary to defend themselves. So far as ascertained, the first to venture a defense in any degree was Saadia ben Joseph (died 942), who was gaon in Sura and a very prolific writer. In his translation of the Bible into Arabic, and in his commentaries upon it, as well as in his philosophical work, "Emunot we-De'ot" (written in Arabic and translated into Hebrew by Judah ibn Tibbon), he attacked the claims of Christianity and Islam; the former receiving from his pen greater attention than the latter, because Islam was not so insistent in its missionary zeal as Christianity. Saadia maintained that Judaism would always exist, and that its religious system, which allowed man to reach perfection as nearly as possible, would not be displaced by any other. In any case, Christianity, which transformed mere abstractions into divine personalities, was not qualified to supersede it; nor was Islam, which lacked sufficient proof to displace the undisputed revelation from God on Sinai. From the period of Saadia polemical passages are encountered in Midrashic works and ritual poems directed against both Christianity and Mohammedanism; but although such passages usually close with some kind of a defense of Judaism, they seem to labor under a species of reserve and timidity. But when at the time of the Crusades fanaticism broke loose and the might of the Church grew rapidly; when, furthermore, the Christian clergy had learned to make use of the services of baptized Jews in aiding schemes for the wholesale Christianization of their brethren, the leading spirits among the Jews felt constrained to lay aside all hesitation and reserve, so that with the twelfth century Jewish polemics appeared more frequently and more numerously. In northern France, R. Samuel b. Meïr (Rashbam) and Joseph Bekor Shor demonstrated the weakness of the foundations sought for Christianity in the Bible; and Joseph b. Isaac ḲimḦi wrote the "Sefer ha-Berit," in which he applied himself to the discussion of Christian dogmas and their scientific refutation. Moses ibn Tibbon, in Montpellier (1240), and Meïr b. Simon wrote polemical works; and the latter in addition compiled the apologetic book "MilḦamot Miẓwah." In Spain, although prominent Jewish scholars had embraced Christianity and placed their services at the disposal of the Church for public disputations and polemical writings, there were also Jewish Apologists that published their replies, either in special books or in the shape of letters addressed to the apostates. Against Abner of Burgos (called, as a Christian, Alfonso of Valladolid), ShemṬob ibn Shaprut wrote his pamphlet "Eben BoḦan" (The Touchstone). To Maestro Astruc Raimuch (who, as a Christian, took the name of Francisco Dios Carne) Solomon b. Reuben Bonfed addressed his epistle, full of sharp points, against Christianity. The philosopher Ḥasdai Crescas singled out Solomon ha-Levi (who, as a Christian, bore the names of Paul de Santa Maria and Paul of Burgos) and replied most vigorously to his attacks upon Jewish doctrine. Possibly the most important apologetic writings of all are those of Profiat Duran, of the fifteenth century, and of Simon b. ẒemaḦ Duran. Around these arrayed themselves a number of prominent Apologists, who wrote independently or quoted chapters from the works of the Durans. In Italy Abraham Farrissol (born 1451) wrote an apologetic book, "Magen Abraham" (Shield of Abraham), in which he proved that the popes had permitted the Jews to take usury in order to enable them to pay the high imposts laid upon them. In Germany, in the beginning of the fifteenth century, Lipman of Mühlhausen wrote his apologetic treatise, "NiẓẓaḦon" (Victory), which name was given also to many other books of similar scope published in Germany. Much less fanatical were the attacks encountered by Judaism from the side of Mohammedanism. The far more favorable political and social position of the Jews among the Mohammedans of Persia and Egypt and among the Moors in Spain—the latter of whom possessed but a scanty knowledge of the Bible and of Jewish literature—hardly gave such scope to aggressive polemics as would call out the Jewish defense. In addition to Saadia and to the Karaite writers, the following were the chief Jewish authors who assailed Islam in defense of Judaism: Sherira b. Ḥanina Gaon, Judah ha-Levi (in his "Kuzari"), Abraham ibn Ezra, Moses b. Maimon, Moses of Coucy, and the author of the "Zohar". The whole range of Jewish literature contains but a single production of any extent (originally a portion of a larger work) that applies itself to an attack upon Islam. Under the title "Ḳeshet u-Magen" (Bow and Shield) it was published in the eighteenth century at Leghorn as a supplement to Simon Duran's work, "Magen Abot" (The Shield of the Fathers). This supplement was translated into German by Steinschneider in 1880 in "Magazin für die Wissenschaft des Judenthums." The invention of printing was the signal for the outpouring of a veritable flood of anti-Jewish literature. Johann Christian Wolf, in the second part of his "Bibliotheca Hebræa," published in 1721, enumerates the titles of all publications by Christians against Jews and Judaism; and these titles alonefill fifty quarto pages of his book. Kayserling in his "Biblioteca Española-Portugueza-Judaica," pp. 114 et seq., gives a list of anti-Jewish writings in Spanish. To the earlier common calumnies—and especially to that so often made by Spanish apostates, that the Talmudical passages directed against the heathens were in reality intended against Christians —there was added after the twelfth century (occasionally at first, but afterward more generally) the accusation that the Jews used the blood of Christians for ritual purposes. This is the identical accusation which the Romans of the second century made against the Christians. At the same time the charge is occasionally encountered that the Jews pierce the consecrated host until blood flows from it. Sad to say, Catholic churchmen themselves spread these calumnies in order to furnish collateral proofs of the doctrine of transubstantiation enunciated at the fourth Lateran council in 1215. Jewish Apologists henceforth had to take notice of this accusation as well. An apologetic book in the spirit of Lipman Mühlhausen's "NiẓẓaḦon" was written by the Karaite Isaac of Troki (near Wilna, died 1593), entitled "Ḥizzuḳ Emunah." The blood-accusation was taken up by Isaac Abravanel in his commentary upon Ezekiel; by Samuel Usque —who had escaped from the fangs of the Inquisition—in his "Consolaçam as Tribulaçoẽs de Ysrael" (1553); by Judah Karmi in his "De Charitate" (1643); by Manasseh b. Israel in his "Vindiciæ Judæorum" (1656), translated into German by Marcus Herz, with a preface by Moses Mendelssohn; by Isaac Cantarini in his "Vindex Sanguinis" (1680); by Jacob Emden in his open letter prefaced to his edition of the "Seder 'Olam Rabba we-Zuṭṭa" (1757); by I. Tugendhold in his "Der Alte Wahn," etc. (1831); by I. B. Levinsohn in his "Efes Dammim" (1837); by L. Zunz in "Ein Wort zur Abwehr" (1840), and by many others. Apologies of a more extended scope were written by the above-mentioned Samuel Usque, who treats historically of the departed glory of Israel and of the end of the period of Jewish power and wisdom; by David d'Ascoli (1559), and by David de Pomis, who wrote the well-known apology "De Medico Hebræo" (1588), dedicated to Duke Francis II. of Urbino. Other Apologists were Solomon Ẓebi Uffenhausen, author of "Ẓeri ha-Yehudim," published in 1615; the proselyte Abraham Peregrino ( , proselyte), who wrote "Fortaleza," translated by Marco Luzzatto in 1775 into Hebrew; Emmanuel Aboab, author of "Nomologia," written in Spanish, 1629; Simon Luzzatto, with his treatise upon the condition of the Jews; Jacob Lombroso (1640); Balthasar Orobio de Castro, who wrote apologetic essays in Amsterdam; Cardoso, with his work, "Excellencias de los Hebreos" (1679); Saul Levi Morteira (died 1660); Isaac Aboab; Judah Briel (1702); David Nieto, who wrote "Matteh Dan" (1714); Isaac Pinto (born in Bordeaux, 1715); and Rodrigues Texeira (died 1780). With Moses Mendelssohn's letter to Lavater, Jewish apologetic writings assumed another character: the question became one of political rights for the Jews. And it is indeed true that spiteful attacks upon Jews and Judaism have not yet ceased. Even the cultured classes among the most enlightened nations are not yet able to divest themselves of the ancient prejudices and traditions. Atavistic sentiments often show themselves stronger than the dictates of reason. But the apologetic writings of to-day are almost exclusively of a political character, and will be rendered wholly unnecessary only when political and social equality the world over is an accomplished fact.See Anti-Semitism, Blood-Accusation, Desecration of Host, Disputations, Polemical Literature. De Rossi, Bibliotheca Judaica Antichristiana, Parma, 1800.